Last time I introduced you to a new method of studying the Bible called SQUAT. This week I would like to take you through a passage as I saw and understood the meaning for me. I have the right to do anything,” you say—but not everything is beneficial. “I have the right to do anything”—but I will not be mastered by anything ( NIV). You say, “I am allowed to do anything”—but not everything is good for you. And even though “I am allowed to do anything,” I must not become a slave to anything. (NLT). Just because something is technically legal doesn’t mean that it’s spiritually appropriate. If I went around doing whatever I thought I could get by with, I’d be a slave to my whims (The Message). S – Say the Scripture passage out loud. This time I picked 3 versions because I wanted to really get it into my head. As soon as I found The Message version – AHA – it made sense. And it reminded me of a employee of the CBC radio who definitely did that – went around doing whatever he thought he could get away with. Thank the Lord – he was found out. Q – Ask God questions about what you read. I wanted to discover more about what Paul was talking about so I read further. The physical part of you is not some piece of property belonging to the spiritual part of you. God owns the whole works. So let people see God in and through your body (The Message). My whole body belongs to the Lord – my face, my smile, my joy, my caring, my listening. How should our bodies be seen by others? What would be pleasing to God? Our bodies are not the most important part – He wants the whole package – body, mind and spirit. This fits right into what Kimberley is trying to help us with – the whole package. Are we Fit for Faith? How is my health? my eating, drinking, sleeping habits? my friendships? my fitness? How do I care for my body? Do I neglect it? Pamper it? Abuse it? How can I change the way I view my body? God can show me how to care for my body, mind and spirit if I ask Him. U – Use the questions you have asked to discover more about yourself. There is big difference between obsession and lifestyle choices. We choose what we believe is right for our bodies. God has shown me that I have allergies. This has led to discipline and joy in being healthy. I do not desire those foods. There is no envy when others eat them. He freed me to find the food that will make me healthy. Now I am looking for all natural foods – knowing that they are the best for my body. A – Take time to go to God in prayer and ask Him now to reveal more to you. Lord, help me to continue to learn more about my body – how to get it healthy. And if you desire it – help me to encourage others to watch what they eat as well. Help all of us not to be swayed by advertisements or well-meaning friends. Help us to listen to You, alone. Help us make good healthy choices. I know that our society, through politicians, big business and money, have changed our way of thinking about food. Help us to see your way of thinking because their way is not healthy. T – Take away – What have I learned today? Learning more and more about food choices is helping me make wise choices. I will continue to eat this way – naturally, as it is working – I don’t take any pills. Continue to show and protect me in my choices. 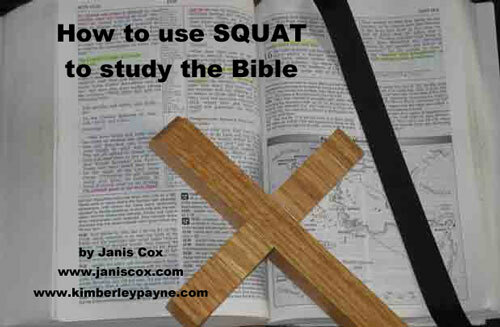 If you think working through the SQUAT method would help you get more out of your Bible Study I would be pleased to listen to how God has spoken to you. Please email me at Janis. Or leave comments below. Janis Cox is a wife, mother, grandmother, a sister and friend. She has been married for almost 41 years to a wonderful, caring and patient husband – they have three grown children who are married; they have 5 grandchildren and a new one on the way. 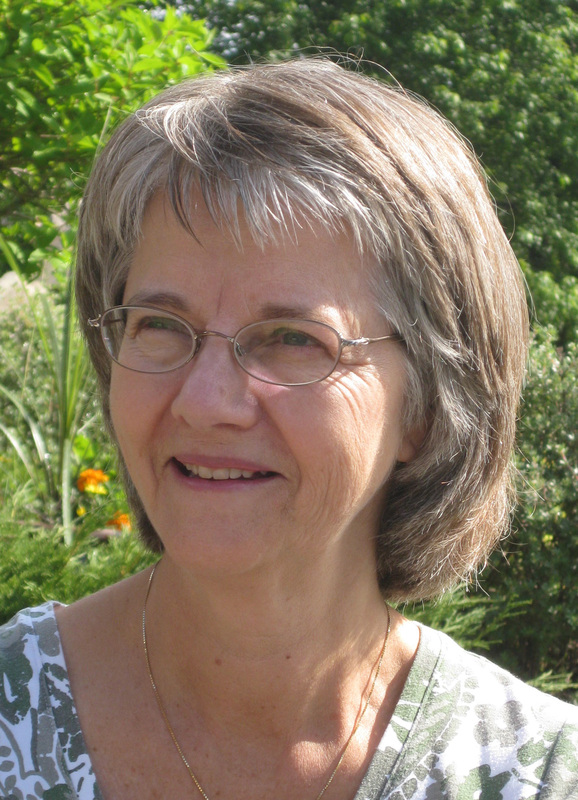 She is a writer, watercolour artist and person who always is involved in doing something. She has her fingers in many pies – but all of them are delicious. A friend once told her that she saw a vision of her – with a whole bunch of coloured balloons and she tried to capture each one of them. As a former public school teacher she loved to write poems for her kids. With this background she has now published her first illustrated children’s book, Tadeo Turtle. She is a member of The Word Guild and Inscribe. You can find her at her website www.janiscox.com. This entry was posted in Bible study, Guest Post, Prayer and tagged Bible study, Fit for Faith, prayer, scripture, SQUAT by Kimberley Payne. Bookmark the permalink.